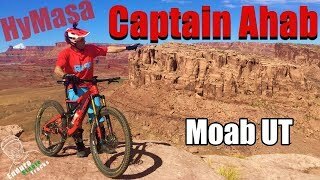 The Amasa Back jeep trail is no longer the prefered option for MTBr's to gain access to Captain Ahab. HyMasa Trail has arrived! The Hymasa/Captain Ahab ride is one of the best of the best. Enough climbing to pump you up and raise your pulse to ready you for the massive dose of adrenaline you'll receive on the descent. 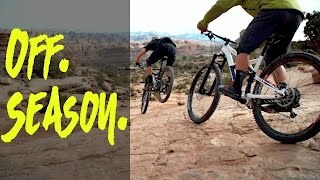 MTBing ecstasy is what it is. I can not do justice for Captain Ahab in words. Most intermediate riders will walk a spot or two on this trail. Fact is there is even a sign that says you should walk a particularly risky spot on the trail. But don't let that dissuade you from the experience Ahab will etch in your memory. If confidence eludes you from time to time...just walk it. Start at the parking area along Kane Creek Blvd (just below the start of the route) . Ride up the dirt road for a short bit then bust right onto HyMasa Trail singletrack down to the creek. From there it's a short jaunt up Amasa Back followed by another right back onto HyMasa Trail. There is great signage to keep you on point. From here it is all sweet singletrack. HyMasa is a fun and winding 3.1 mile climb with scattered descents. 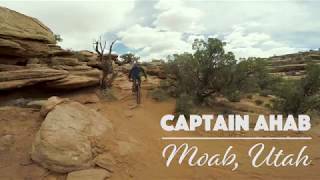 On its own, HyMasa is an excellent romp through pristine Moab singletrack. You'll cross Amasa Back a couple of times and will be offered the option to cut out on the Amasa to Ahab connector, but don't do it! The views alone are worth the effort to get all the way to the top. The transition to Captain Ahab from HyMasa Trail is quick and happens during an easy climb. Take a moment to stop and enjoy the outstanding views over Jackson Hole and Canyonlands. Continue climbing along the rim until the trail turns back to the south and east. A big rock drop will mark the start of the descent. The upper half of the trail is designed for longer travel bikes and riders who enjoy technical descending. There are plenty of options to avoid most of the larger drops, so you can make it as hard as you want. After the first series of descents and rollouts, Captain Ahab contours a bit with some short punchy climbs and drops. The lower half of the route drops into tight singletrack nesteled above Kane Creek. This part of the route is fast and exciting with some exposure along the cliff edges. It has good flow and very little in the way of climbing. The final stretch of Captain Ahab drops down through a spicy rock garden before rolling out to the Amasa Back / Cliffhanger road. *Note: If you're looking for a shorter route or want to avoid the more technical upper sections, there is a bypass onto the Amasa to Captain Ahab Connector at 3.3 miles into the HyMasa Trail climb. Great ride! Awesome views. Well built technical ride with nice climbs and some fun flow. Joey and I did this again. I loved the ascent and he loved the descent. I actually made the final climb from the creek to the car clean. The hardest ride I've ever done. You have to be highly skilled and in great shape to hang with Ahab. Technical ride, had a blast. Hucking on the Hymasa Trail. Enjoy miles of smiles on Hymasa Trail. One of many fun rock features on this trail! Having a blast with a little technical drop. Shelf drop on lower Captain Ahab Trail. Dropping in on one of the harder features on Ahab. View of the road below.